Anchor Ventures is a speaker series aimed at inspiring and supporting the development of startups and other technology companies across Maryland. It is based on the Venture Café model that started in Boston and has led to an entrepreneurial groundswell in cities across the nation. 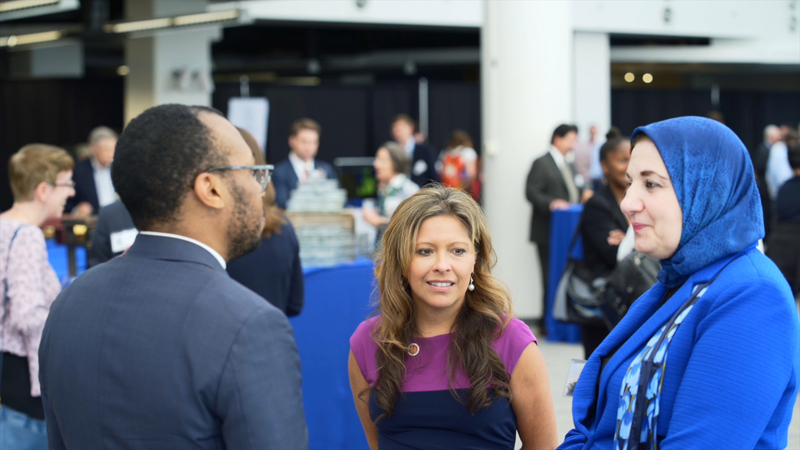 Here in Maryland, anchor institutions are joining forces to provide local entrepreneurs and investors with a regular gathering space to learn and network. Anchor Ventures programming will create a regular “anchor” (a venue and a hub of activity) to spotlight resources, as well as excitement about building and participating in an innovation ecosystem. The series is a collaboration between Johns Hopkins Technology Ventures, UM Ventures and the University System of Maryland. Each Anchor Ventures event will be held from on the third Thursday of the month from 4 pm - 7 pm beginning February 2018. The program will reinforce the strong elements of the ecosystem that exists already in Maryland and provides a forum for enhancing them for entrepreneurs, investors and the resource partners in the region. Many times, entrepreneurs are not aware of the full extent of resources available and we want to create more connections across the ecosystem. Starting locally with an eye toward expansion regionally, Anchor Ventures will provide a focal point to grow and enhance the entrepreneurial ecosystem in our state. By addressing the much-needed challenges we have on attracting, educating, retaining and connecting the players across our ecosystem, we believe we can start to make change that matters. Critical to building our innovation ecosystem in Maryland is the development and implementation of a robust infrastructure that enables ideas in our labs, classrooms, dorms, garages and other venues to progress from research and invention to a viable path to market. Our area is fortunate to be awash in world-class technologies. And we have been diligently building the types of affordable, flexible space that our startups need. But some significant limitations remain in our infrastructure including the lack of a sizable, educated, experienced startup talent pool in the region to anchor our companies here as well as a large class of angel investors with significant technical expertise related to the types of technologies being developed here. We need to build a strong network of startup talent to attract funding and a pool of early stage investors educated to make first bets on our region’s technologies so that our startups have a better chance of developing locally. The anchor of our state is Baltimore, and the anchor of our innovation is our great academic institutions. The programs we propose will allow us to engage the anchors of our entrepreneurial ecosystem and provide for a consistent and focused effort for the region and the State. The objective of Anchor Ventures is to attract, train, and retain talent at all levels through engagement and education as well as through enhancement of interactions with existing businesses and partners in the region. First, it will further the education of entry level and upcoming early career employees. It will also provide education for early stage investors to better understand/access the types of technologies being created/spun out in our region. Second, the program will provide networking and connection opportunities across the ecosystem – from mentoring by more seasoned personnel, to connection/collaboration amongst veteran entrepreneurs enabling shared experiences, to linking of investors and ideas, to creating alliances amongst anchors and later stage industry partners. Third, the regular programming will create a true, regular “anchor” (a venue and a hub of activity) to spotlight resources and convene those in in the area excited about building and participating in an innovation ecosystem.